Controlling your home theater system used to be easy—you simply told your kid to turn the knob and presto, Honeymooners. But today's home theater packed with feature-rich TVs, cable boxes, AV receivers, and streaming boxes—and all demanding their own remotes—there's no way the little guy can keep up. 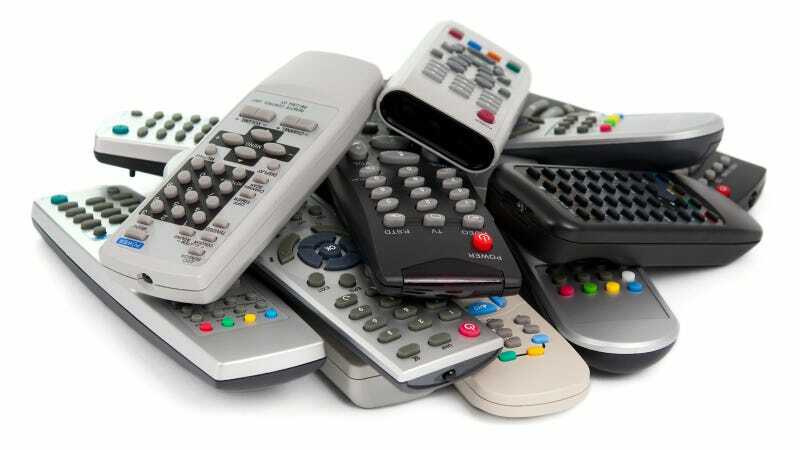 Instead, replace your pile of remotes with an app that does everything they can do and more. Dijit is a personal media assistant app that allows you to build a custom electronic program guide for your favorite channels, create personalized menu layouts, discover new shows, or get series recommendations from Facebook friends. And with the help of the Griffin Beacon—pairs with the iPhone via a Bluetooth connection, then translates the iPhone's command into IR signals—it can be utilized as a universal remote. The Beacon is able to control not just the TV but AV receiver, Blu-ray players, and even Xboxes all from your iPhone. The Djiti app itself is free, though it is an iOS exclusive and requires rev 5.0 or later, but the Beacon runs $80—a price, according to our own Casey Chan, that is well worth it. iRule also uses a combination of software and hardware to control your home devices. However, unlike the Beacon, iRule leverages your home's existing Wi-Fi network to send commands, allowing it to communicate with just about any Wi-Fi-enabled device—A/V equipment to lights to thermostats. Users first create customized menus, commands, and key layouts using the iRule Builder web app, then sync them to the iRule app. The app then communicates with a separately-sold gateway that, in turn, sends commands to the IR-based devices. iRule can also communicate with TCP/IP-based devices directly. It's software comes as either a $50 Basic package that supports up to three separate controllers and a $100 Pro package that allows up to 5 unique remotes, allowing remote monitoring of supported devices, and other features. The hardware isn't cheap either, running between $95 and $300 on the iRule site for IR gateways. The RedEye app works much like the Djiti-Beacon—your phone communicates via Wi-Fi with the base station which translates the command into IR for the devices. However, the RedEye is far more platform-tolerant and can be used with the iPhone, iPad, iTouch, Android, PCs, and even the Kindle Fire. An online database of more than 85,000 control codes covers the major brands and models of devices. The app also allows you to define profiles—custom menus, button layouts, etc—for each room in your house, then share that profile with your roommates and plan your collective viewing schedule on the integrated programming guide. The RedEye base station retails for $200 on Thinkflood as well as the feature-limited, iOS-exclusive RedEye Mini that retails for $50. The Rē remote control app from NewKinetix essentially cuts out the Wi-Fi-to-IR middleman by utilizing an IR dongle that plugs directly into your iOS device (sorry Android and WP users). When used in conjunction with the free Rē app, this system will allow you to control (literally) any IR device. In addition to the Rē's large and regularly updated database of control codes, it can also learn the controls of a device from the device itself. What's more, you can create a custom menu for controlling, say, your PS3, then use the integrated BUMP app to painlessly transfer it to another iOS device. The plug-in hardware will set you back $60. The Zmart system also leverages a 5-ounce dongle that plugs directly into your phone. But since it plugs in to the device's audio jack rather than a 30-pin connector, it can runs on both iOS and Android. Like the others, the Zmart hosts a massive collection of 200,000-plus control codes that support virtually every major AV manufacturer and can easily learn the ones it doesn't. The Zmart remote retails for $20 on the Vivatek website.